Add Cayenne to your Favourite Herbs list. The bouquet is dusty but slightly aromatic. The flavor is extremely hot, pungent and biting. 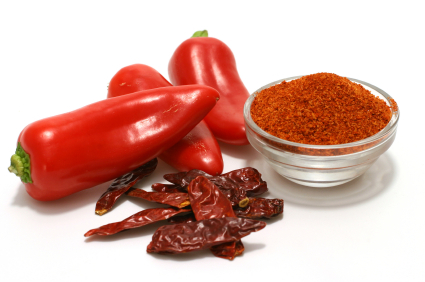 It should not be used to the same degree as paprika, which it resembles, for it is much stronger. When used as a condiment it should be sprinkled sparingly. It should be kept in a dark container as it is affected by sunlight, and bought in small quantities as it deteriorates rapidly, losing its pungency. Capsicum annuum is traditionally considered by Herbalists to be hot and drying and has been a popular herb in the equatorial systems for culinary, cosmetic and health use. Cayenne may cause intestinal burn. Take with fatty meal or drink (milk) to reduce burn. Avoid large doses in pregnancy or lactation. FOR THE FIRST WINTER IN OVER 40YEARS, I HAVNT SUFFERED FROM "DEAD FINGERS" IN THE MORNINGS. MY HANDS ARE WARM, PINK AND FUNCTIONING. MY ARTHRITIC WRISTS ARE SO MUCH MORE MOBILE, AND PAIN FREE! FANTASTIC PRODUCT. LOVE IT. Haven't been taking this for long but feeling good .... A little burn from time to time... its a good burn. Use it in conjunction with other herbs and find no 'burn' if taken with food. I find it great as a natural fat burner and a real booster to my metabolism, especially before any cardio training, it's great! We purchased the cayenne capsules, along with some others, and have had some great results. Knowing that these are fresh and made up when ordered helps to reassure us that we are getting a quality product. Many thanks. Probably not the thing for you if you get heartburn. Trick is to take directly after a meal to avoid the "burn"
If you want to give your metabolism a boost without stressing your body with stimulants then this is a great option. Use this to block salicylate as well so I can eat salicylate containing food.www.fedup.com.au recommended this brand and so far it has delivered,it's very hot so I put it in capsules and take it with some food 30 min before I eat my sals containing meals. About two years ago I was diagnosed with salicylate intolerance and struggled to find a way to treat it as most doctors have not even heard of the problem, let alone know how to help. I decided to try these pills as an experimental study found capsaicin before a meal can prevent the symptoms associated with salicylate intolerance. I have found that two of these cayenne pills before a meal stop all symptoms I previously would have experienced. For the first time I have found something that actually works and it has changed my life. I cannot recommend this product enough for people who have similar problems!!! Have been looking for good quality Cayenne in capsules. horseradish to freshly brewed chamomile tea. coffee. This can be taken in grape juice also.